This PDF 1.4 document has been generated by / iText 2.1.7 by 1T3XT, and has been sent on pdf-archive.com on 16/06/2016 at 19:04, from IP address 74.7.x.x. The current document download page has been viewed 2559 times. File size: 295 KB (12 pages). University Board of Regents, Head Football Coach Art Briles, and Athletic Director Ian McCaw. Briles that they represented him as his attorneys in the Hernandez lawsuit. purposes of this litigation and discussed the case and allegations with him. (4); Rule 1.06(b)(1) and (e); Rule 1.08(f); Rule 3.04(a) and Rule 3.07(a). 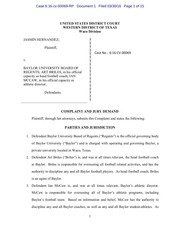 the Baylor Office of the General Counsel that provides a complete recitation of these facts. fiduciary duty, negligence, and intentional infliction of emotional distress, among others. 1. 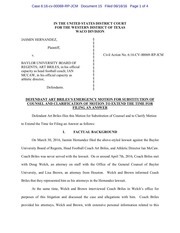 Substitution of counsel for Defendant Art Briles to be represented by Ernest H.
Art Briles against him in any termination proceedings, mediations, or arbitrations. 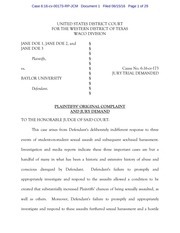 any kind obtained in the representation of Defendant Art Briles. complaints that she was raped by a player. 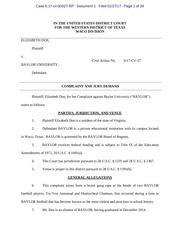 Baylor lawyers this week asked for extra time to respond to Hernandez's lawsuit. The request said the &quot;primary reason&quot; is to &quot;explore early resolution&quot; and avoid litigation. It said Hernandez's lawyers agreed to the extension. August 2008 until May 2010, before Starr was hired. 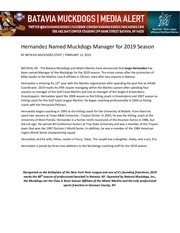 acting head football coach effective immediately. 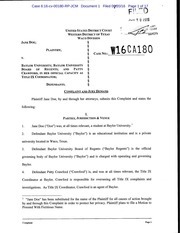 Starr resigned as chancellor on June 1, but remains on the Baylor Law School faculty. breach	of	his	written	contract,	as	Head	Football	Coach	on	May	26,	2016. States	District	Court,	Western	District	of	Texas,	Waco	Division. This file has been shared by a user of PDF Archive. Document ID: 00388517.